We recently wrote about a new piece of art from British artist Luke Jerram depicting the seismogram from the Tōhoku Japanese Earthquake. Since then, I had the pleasure of interviewing Jerram to learn more about how he integrates technology and science into his artwork. Jerram’s art goes beyond paint and canvas. His works include performance pieces of flying orchestras, street pianos that anyone can play, acoustic wind harps, and glass sculptures of viruses and sound files. A major theme in his art is to animate hidden phenomenon, be it sound, microscopic organisms or scientific data. His work has been installed and displayed all over the world and he is constantly searching out new inspiration and new mediums to work with. GeekTech: What drew you to study art when you entered school? Luke Jerram: "Just something I was quite good at. I'm also interested in how I see because I'm colorblind." GT: How has being colorblind shaped your approach to making art? 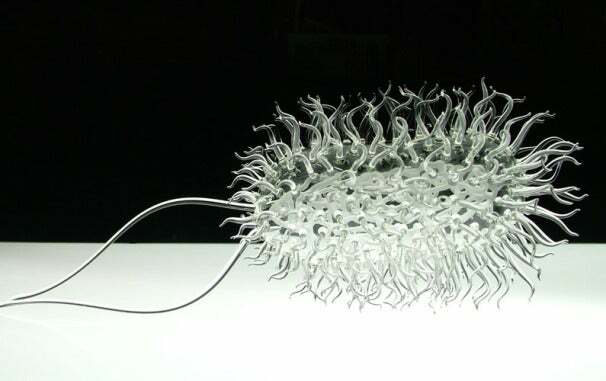 GT: Your Glass Microbiology sculptures are really stunning; how did you get interested in bringing science and art together? LJ: "I had a place at college to study engineering but decided to go to art college instead. I'm interested in how the world works and is made which applies to both artist’s and scientist’s interests." "I use technology like any other tool--pencil, brush, chisel, etc. The better the technology the less you notice you're using it." GT: The Tōhoku Japanese Earthquake Sculpture was made through 3D printing, as was your 28 Seconds of Hiroshima piece. How long have you been using 3D printing and how has it changed the way you produce art? LJ: "It's something I'm just currently exploring. I like the way an object can be made without use of human hand, how data can be altered and transformed to make objects of meaning." GT: How much does technology play into your creative process and the artwork you produce? LJ: ""I use technology like any other tool--pencil, brush, chisel, etc. The better the technology the less you notice you're using it." GT: What’s your favorite medium to work with? GT: Who are your favorite artists or genres of art? LJ: "I have no favorite. I'm interested in everything. [My] latest interest is in ‘wearable digital art’." GT: What have been the highlights of your career so far? LJ: “Flying over London for Olympics this year and completing singing sculpture Aeolus.” Jerram's Sky Orchestra flew over London this year to celebrate the upcoming 2012 Olympics. Sky Orchestra is a visual audio installation that combines music with hot air balloons to create a flying orchestra. Aeolus is Jerram's acoustic wind project consisting of an aeolian harp that uses wind to create music. The project took over 3 years to complete and was inspired by an interview with a Qanat desert well digger who revealed that he would hear the wells he had dug “singing in the wind”. GT: What’s next for you? LJ: "Residency in Washington Museum of Glass next week." GT: Lastly, I love the engagement and wedding rings you made for your wife, what was the inspiration for each of them? See Luke's website for more about his work.